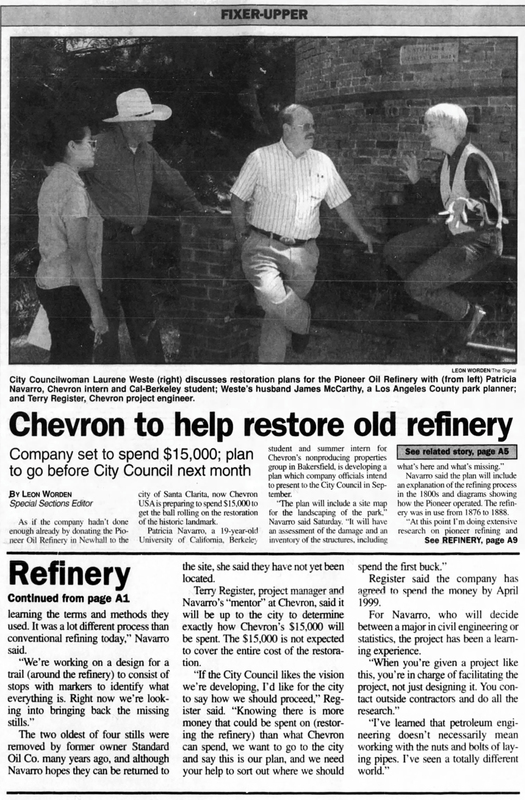 SCVHistory.com | Newhall | Chevron to Help Restore Pioneer Oil Refinery, 1988. Chevron to Help Restore Pioneer Oil Refinery. By Leon Worden, Special Sections Editor. The Signal | Tuesday, August 4, 1998. Update: The two original stills were subsequently located. See them here. Company set to spend $15,000; plan to go before City Council next month. As if the company hadn't done enough already by donating the Pioneer Oil Refinery in Newhall to the city of Santa Clarita, now Chevron USA is preparing to spend $15,000 to get the ball rolling on the restoration of the historic landmark. Patricia Navarro, a 19-year-old University of California, Berkeley student and summer intern for Chevron's nonproducing properties group in Bakersfield, is developing a plan which company officials intend to present to the City Council in September. "The plan will include a site map for the landscaping of the park," Navarro said Saturday. "It will have an assessment of the damage and an inventory of the structures, including what's here and what's missing." Navarro said the plan will include an explanation of the refining process in the 1800s and diagrams showing how the Pioneer operated. 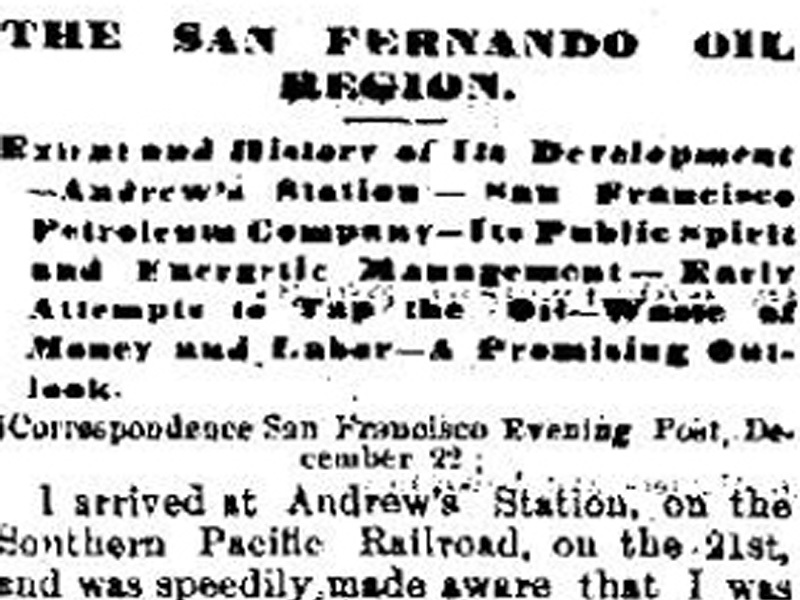 The refinery was in use from 1876 to 1888. "At this point I'm doing extensive research on pioneer refining and learning the terms and methods they used. It was a lot different process than conventional refining today," Navarro said. "We're working on a design for a trail (around the refinery) to consist of stops with markers to identify what everything is. Right now we're looking into bringing back the missing stills." The two oldest of four stills were removed by Standard Oil Co. many years ago, and although Navarro hopes they can be returned to the site, she said they have not yet been located. Terry Register, project manager and Navarro's "mentor" at Chevron, said it will be up to the city to determine exactly how Chevron's $15,000 will be spent. The $15,000 is not expected to cover the entire cost of the restoration. "If the City Council likes the vision we're developing, I'd like for the city to say how we should proceed," Register said. "Knowing there is more money that could be spent on (restoring the refinery) than what Chevron can spend, we want to go to the city and say this is our plan, and we need your help to sort out where we should spend the first buck." Register said the company has agreed to spend the money by April 1999. For Navarro, who will decide between a major in civil engineering or statistics, the project has been a learning experience. "When you're given a project like this, you're in charge of facilitating the project, not just designing it. You contact outside contractors and do all the research." "I've learned that petroleum engineering doesn't necessarily mean working with the nuts and bolts of laying pipes. I've seen a totally different world." Presentation ©1998 The Signal | Used by permission.